Luxman has begun to rebuild a worldwide reputation as one of the premier Japanese audio brands. The current product range is considerable and expanding and features a bewildering variety of solid-state and valve amplifiers, SACD and universal disc players and phono stages. The latter is an interesting product line for Luxman to make as every single integrated it produces, be it valve or solid-state is already equipped with an internal phono stage. Word had begun to filter through to the Hi-Fi Choice office, that these phono stages are far more than a tick in the box of a feature sheet and that they represent a genuine challenge to some of the best external phono stages in the thousand pound range. Naturally we had to have a listen for ourselves. The L550A-II tested here is the entry-level Class A design. 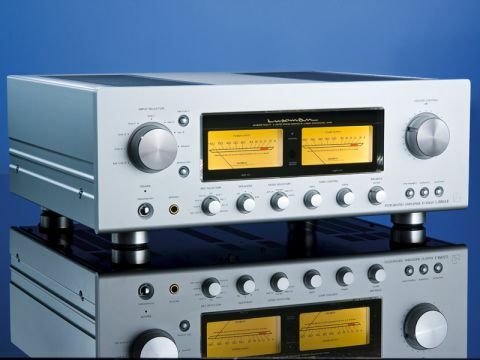 Not that there is a great deal of 'entry level' thinking about the facilities, the L550A-II entirely rejects the trend towards minimalism in amplifier design. It features four line inputs, the phono input, two tape loops and a pair of balanced inputs. Impressively, the XLR inputs have the facility to be adjusted to suit both XLR wiring types at the push of a button, which allows the Luxman to work well with any balanced source. The front panel features bass, treble and balance controls, a recording selector and a stereo/mono selector. All of these can be switched out of the circuit, but the scope they have for fine-tuning the output to suit your room and speakers mean that you may end up not doing so. Dominating the front panel is a brace of VU meters, one per channel. Whilst probably not accurate enough for studio work, they give a reasonable idea of the output and they are somewhat hypnotic in practice. In terms of its dimensions, the Luxman has more in common with a high-end AV receiver than a stereo amp. Such is the width and depth of the chassis, there is a reasonable chance it will require the top shelf of any normal-sized equipment rack. In view of this considerable bulk, it is something of a surprise to learn that the output from this vast chassis is 20 watts into eight ohms, rising to 30 watts into four ohms. Even by the standards of Class A amplification, this is a surprisingly small amount, although enough to drive a variety of reasonably sensitive speakers without too much trouble Luxman has also gone to great effort to reduce distortion on its output stage and has developed its own proprietary system called Only Distortion Negative Feedback (ODNF). This works by isolating noise and distortion at the output from the music signal and applying limited amounts of negative feedback to suppress them. This means the amp does not need to run constant negative feedback and means no DC servo circuit is present, which should further improve sonic performance. Equally distinctive is the line phase sensor on the rear panel. This is a device that can check the phase of the electricity that the Luxman is receiving is correct (having the live and neutral wired incorrectly can be severely detrimental to sound quality). The internal phono stage supports both moving magnet and moving coil cartridges and has a switchable subsonic filter on the front panel. Interestingly, it is optimised to work with moving coil outputs as low as 0.3mV, which means it should have no problem with all but the lowest output designs on the market. It is joined by a headphone amp that makes full use of the speaker circuitry and is designed to be more than up to the task of late-night listening on good-quality headphones. This considerable specification is topped off with a bespoke all-metal remote control, which is beautifully retro in appearance, but also the model of simplicity in use. Luxman has clearly recognised that the remote is the most common point of contact between user and amplifi er and the results are excellent. Luxman is a founding member of Japanese high end and the fit and finish of the L550A-II shows all the hallmarks of the breed. Every control operates with a precision and solidity that is hugely confidence-inspiring (given the sheer number of them on the front panel it's just as well). The chassis has had great attention given to its isolation and layout, and the components used internally are of a high standard, finishing in some of the most solid speaker terminals we've seen in a while. In value terms, the Luxman has to be considered a strong proposition. Whilst it is far from cheap, the extensive connectivity and the presence of a good-quality phono stage and headphone amplifier negates the need to buy external examples of each. It is not the easiest amp to directly compare to the competition, but few other models at this price point offer such a broad range of facilities and features. Other Class A designs especially are generally far more minimalist than the Luxman. Perhaps the closest comparison can be made to rival Japanese brand Accuphase, who also produces high-specification Class A integrated amps but at substantially higher cost than the L550A-II. In use, the Luxman is instantly likeable. Even from cold, there is a sense of exceptional space and realism which only improves as the unit warms up. The 20-watt output must also be taken as something of an understatement as the L550A-II is capable of taking all but the most insensitive designs and driving them to levels that should prove sufficient for all. The overall presentation is calm and unforced. Lively and upbeat recordings are reproduced with their force and drive intact, but at the same time there is no sense of calmer recordings being overdriven. The results are fantastic and it is possible to listen to the Luxman for extremely long periods with no sense of fatigue, staring at those hypnotic VU meters while you do so. Pushed very hard indeed into insensitive speakers, the Luxman will harden up slightly, but avoids any real sonic nasties. One of the more impressive areas of sonic performance is the bass. This is both remarkably tuneful and agile, whilst going substantially lower than might be expected of an amplifier with only 20 watts to its name. There are more powerful amps at the same price that will dig deeper still, but few will match the sheer musicality of the Luxman and the sense of timing that comes from the speed and agility it possesses. This timing is not perhaps as assured as some of the acknowledged specialists but it is no slouch. And what of the phono stage? Put simply, it sounds like an extension of the amp. If this sounds a little anti-climactic, that is not the intention. It's possessed of the same remarkable even-handedness of the L550A-II and the same excellent space and tonality. If you like the sonic attributes of the Luxman then the phono stage should prove equally desirable. As the phono stage was developed as an integral part of the amp, it shares the same behaviour and adds an extremely low noise floor and genuinely useful subsonic filter to improve matters further. It is only the increasing need to use external phono stages with their own sonic characteristics that has lead us to believe that the ideal should be any variance in the way that the line inputs and the phono inputs sound. The L550A-II does exactly that and will allow you to hear and enjoy your turntable, arm and cartridge choice with no intervening layer. This ability to produce the same excellent sonic performance, regardless of input is a huge bonus to multiple-source systems and goes some way to nullifying the very large size of the L550A-II. As a final ribbon to an already very large bow, the headphone amp is more than up to the task of running some of our favourite headphones up to the £500 price point. We secured the Luxman to test whether the phono stage makes it a strong proposition for vinyl users. The answer to this question must undoubtedly be "yes." The internal phono stage is a truly excellent device and is capable of putting up stiff competition to the best standalone devices under £1,000. This excellent device is inclusive to the price of a very talented amp. To simply call this an amp for vinyl lovers is to do it a disservice. The L550A-II is capable of equally stunning results in systems with no turntable and should be auditioned as such. There's no doubt about it, the Luxman is a genuine superstar.